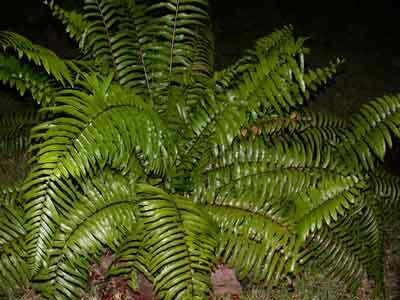 A fern is a plant that looks fernish, or has the word fern in its name. For example, the Macho Fern, the Asparagus fern, or the Elephant-ear fern. Well... that’s a good start, but there's more to it. Although these plants either look like ferns or have the word “fern” in their names, one of them is not a fern. If you look closely, the Asparagus Fern (Asparagus sprengeri), looks like a fern until you notice it has white flowers and red berries. 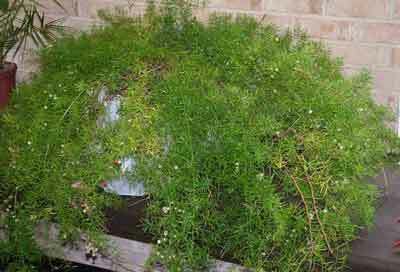 Since ferns don’t bloom, an Asparagus Fern can’t be a real fern. It’s just not macho enough. The Macho Fern, (Nephrolepis falcata, a cousin to the famous Boston Fern often seen in hanging baskets), and the Elephant-ear fern, (Elaphoglossum critnitum), are however true members of the fern club. So, not everything that looks like a fern, is a fern, and just to make things more interesting, some ferns don’t even look like ferns, unless you know what you are looking for. and has a vascular system to carry food and water up to the leaves.